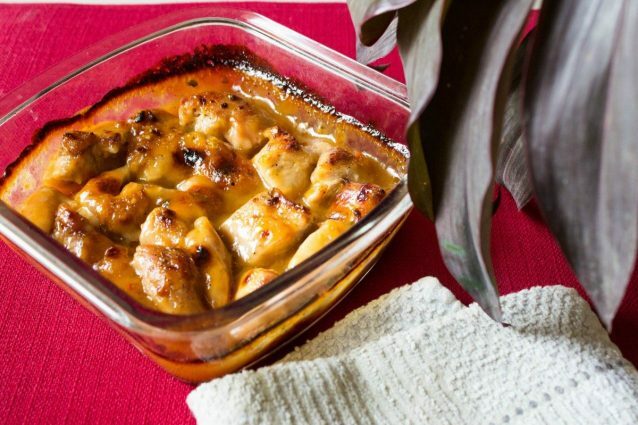 Apricot chicken is a super duper quick to prepare recipe with no fuss involved. All you have to do is stir in a few sauces and preserves, coat the chicken pieces really well in it and pop your baking dish in to the oven. Voila… you have a delicious main meal, snack, side dish ready to be served. You may also use an entire chicken breast or cut the chicken in to bite size cubes, as per your preference. The best about this recipe is that it does not even ask for a long marination time, if in case you are fighting a time crunch. In case you plan to serve it in a party then you may assemble the dish a day before and let the chicken marinate in sauces overnight and just bake it about 15 minutes before you expect your guests to arrive. Preheat oven to 175 degrees C. Clean the chicken breast nicely and then lightly damp it with a clean kitchen towel. Cut the chicken breast in to bite size cube of two 1½ inch to 2 inch size evenly. Season the chicken cubes with salt and black pepper powder. Rub the seasoning really well in to chicken pieces and let it sit for two minutes. In a large bowl add the apricot jam, mayonnaise, tomato ketchup, vinegar, olive oil, dry onion soup mix and mix it all together really well. Add chicken cubes in to the dressing and mix everything well until all the chicken pieces are well coated with the marinade. Transfer the chicken with marinade in to a baking dish. Bake the chicken in the preheated oven at 175 degrees C for 30 to 35 minutes or until the chicken cooks and gets a nice brown coating on top. Serve hot and enjoy! You may even prepare this recipe until step 6 up to a day in advance and then resume from step 7 before you plan to serve. You must cover the chicken with cling film and store it in a refrigerator. 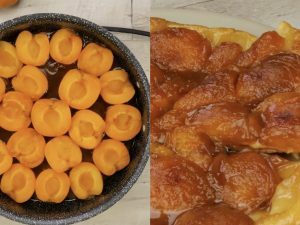 You may also replace apricot jam with two mashed fresh apricots and three tablespoons of honey. You may also add baked apricot chicken cubes to a bowl full of fresh mixed greens and drizzle some vinaigrette over to enjoy a quick and healthy salad. Apricot upside-down cake: so delicious and moist, you’ll love it! Cheesecake eggs: the perfect idea for Easter!